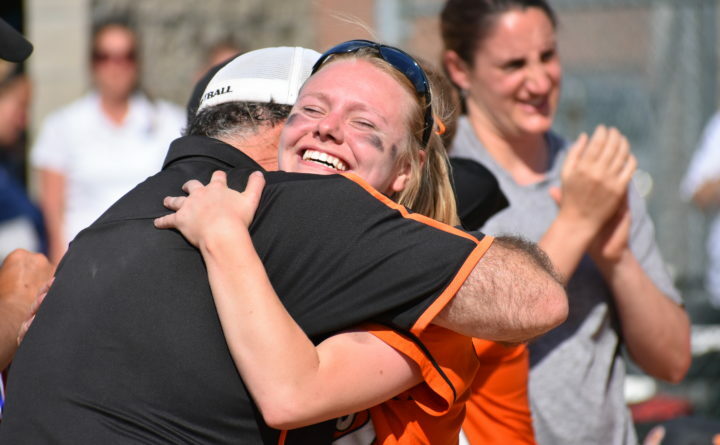 Olivia Cattan of Brewer hugs head coach Skip Estes after the Witches beat Oceanside of Rockland 6-2 to win the Class B North softball title on Wednesday afternoon. BREWER, Maine — Brewer High School sophomore second baseman Kathryn Austin had gone 0-for-10 in her last three games: The Kennebec Valley Athletic Conference championship game and two Class B North playoff games. She couldn’t have picked a better time to snap out of her slump. Austin lined a two-out, two-run single in the first inning and junior right-hander Libby Hewes scattered eight hits to lead the Witches to a 6-2 victory over error-prone Oceanside in the Class B North championship game at wind-swept Coffin Field Wednesday afternoon. Top seed Brewer (19-0) plays Greely High of Cumberland Center (13-7) in Saturday’s 4 p.m. state championship game in Brewer. It was Brewer’s first regional title since it won the state Class A title in 2008. It is the Witches’ first season in Class B. Third seed Oceanside of Rockland finished up at 17-3. The Witches built a 6-0 lead with all six runs being unearned courtesy of six Oceanside errors. Hewes struck out only two but she and her teammates played errorless ball. And Hewes was able to make clutch pitches when she needed to, limiting Oceanside to a 2-for-10 showing with runners in scoring position. Hewes didn’t walk anyone while throwing 84 pitches, 54 for strikes. It appeared as though the Witches were going to squander a bases-loaded-no-outs situation in the first inning until Austin delivered. Jordan Goodrich started the rally by reaching on an infield throwing error, Hewes doubled off the fence and Kenzie Dore was walked intentionally. Oceanside junior ace Chloe Jones struck out the next two hitters on changeups but Austin lined a 1-0 pitch into center to deliver Goodrich and Hewes. “I threw it right down the middle,” said a somber Jones. Dore, who turned in a number of gems in the field and had a pair of hits including a double, saved a run in the second. Jones singled to lead off the inning and moved to second on a wild pitch. Jessica Watkinson slapped a grounder headed toward left field but Dore dove to keep the ball in the infield and prevent Jones from scoring. Hewes then induced an inning-ending grounder. Brewer got another run in the fourth when Becca Gideon singled off Jones’ glove before being erased on Austin’s fielder’s choice. An error on the third baseman, a wild pitch and an error by Jones on Jayden Keefe’s bunt produced the run. The Witches added three more in the fifth. Dore grounded a sharp single to left and scored when the third baseman threw the ball past the second baseman on M.J. Sellars’ grounder and the right fielder made an ensuing throwing error. Gideon singled, Austin was walked intentionally and the final two runs scored when the second baseman mishandled Emily Lord’s grounder. Oceanside coach Rusty Worcester said his team hadn’t committed more than three errors in a game this season. “I think it was just nerves,” said Jones who pitched well in defeat, allowing seven hits with seven strikeouts and two walks, both intentional. “Brewer has a great defensive team. They have a tremendous shortstop (Dore),” Worcester said. The Mariners finally dented the scoreboard in the seventh inning on a single by Grace Woodman, Watkinson’s run-scoring double and Abby Veilleux’s RBI single. In addition to Dore, Gideon was also a repeat hitter for Brewer with two singles. Hannah Moholland stroked two doubles for Oceanside and Jones and Watkinson each doubled and singled.